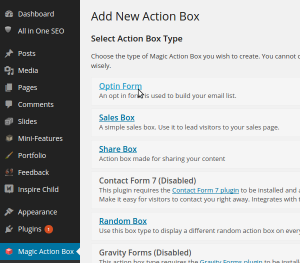 Magic Action Box integrates with some some of the most popular email list services and form plugins. 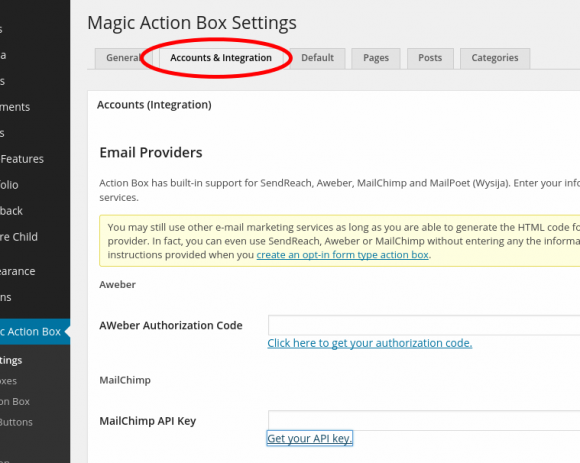 This guide will show you the general steps to take to integrate your email list provider and form plugins with Magic Action Box. There are two options depending on the service you want to integrate with. 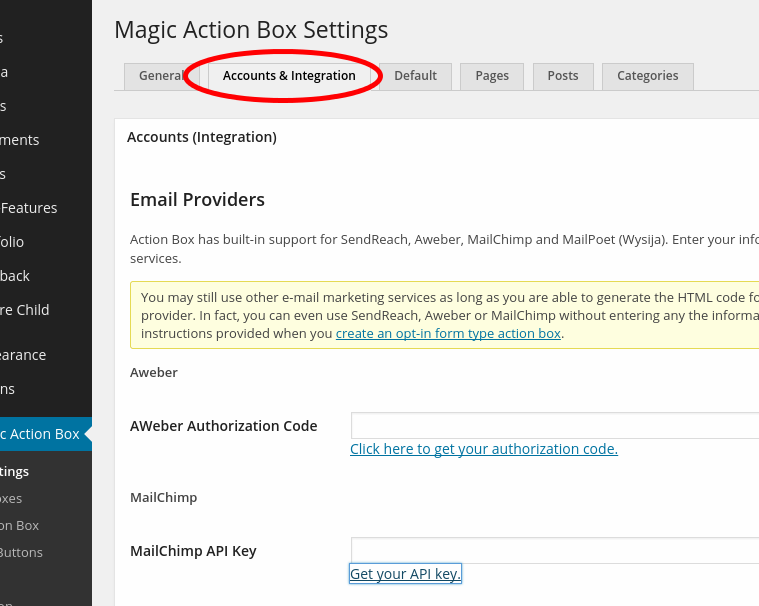 You can connect most email list providers that Magic Action Box integrates with by going to Magic Action Box → Main Settings → Accounts & Integration tab. Follow the instructions for connecting your email list provider with Magic Action Box. Usually you just need to enter in an authorization key or access token. My email list provider is not on the list!Don’t worry if your email list provider is not on the list. As long as the service you use can provide you with an HTML form code, then, you can still use the custom code with Magic Action Box. See this guide on how to use custom HTML form code with Magic Action Box. 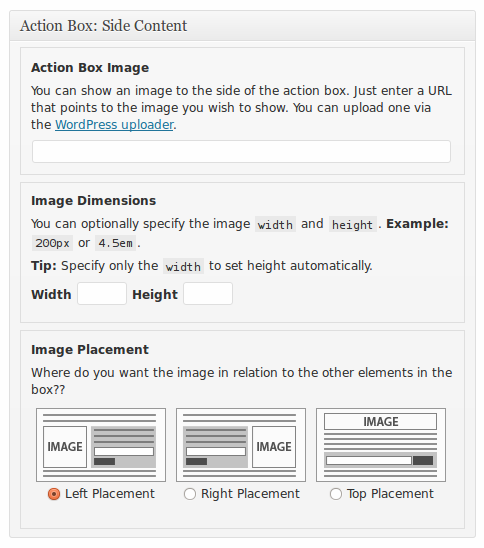 Magic Action Box also integrates with other WordPress form plugins to enhance their form designs and add more options to form placement. To integrate with these plugins, just activate the plugin and you should be good to go. Go to Magic Action Box → New Action Box. In the next screen, set a descriptive name for your action box. Something like: Sidebar form or In-post form or Homepage form. Right below the title field, you’ll see the Action Box: General Settings section. 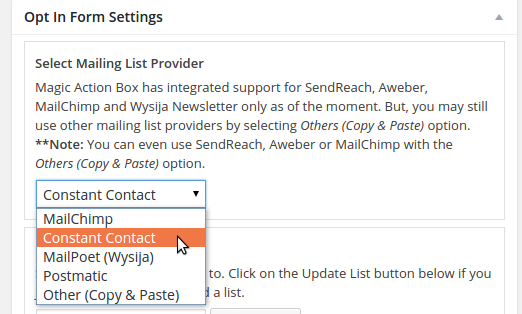 Skip that for now and look for the Select Mailing List Provider drop-down in the next section further down. Choose your email list provider in the drop-down. Now save your action box. 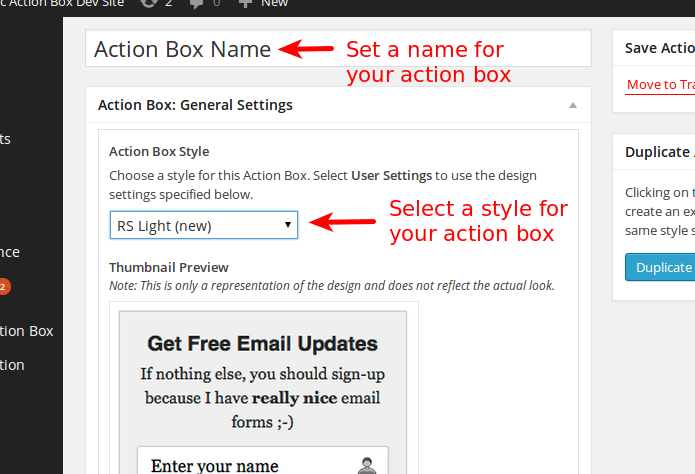 Choose the action box that you created in the drop-down. 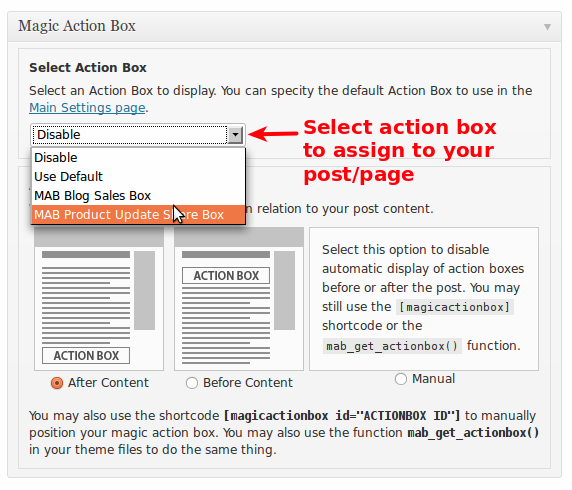 Also specify the placement of your action box – before or after the content. By default, it will be set to show after the content. If you are getting problems, visit to our support site at http://prosulum.zendesk.com and create a ticket. We’ll get in touch within 24 hours.